The Martin Yale 1632 automatic letter opener is ideal for mid-size to large businesses that receive large volumes of mail. 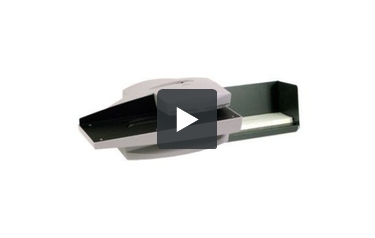 With the 1632 automatic letter opener, you can automatically open up to 7,000 envelopes per hour. All you need to do is place a stack of envelopes into position and turn the letter opener on. The Martin Yale 1632 automatic letter opener will help you to save time, money and improve efficiency in an office. The 1632 automatic letter opener opens stacks of letters in a few minutes rather than hours. This allows you to use your time doing other tasks while your letter opener does the job. Try the Martin Yale 1632 automatic letter opener today and allow it to pay for itself in no time at all. Dimensions: 19.5" x 15.5" x 7.75"
Welcome to MyBinding video. Let’s take a look at the Martin Yale 1632, an automatic letter opener. The Martin Yale 1632 is ideal for midsize to large businesses that receive large volumes of mail. With one simple on/off button, you’re on your way. The action is quick and precise, slicing just 1/8” off the bottom. It can handle a stack of 1 ¾” high and do up to 7000 envelopes in an hour. The blade is tucked away and safe, with two rubber belts pulling it along. There it is, that’s the Martin Yale 1632 automatic letter opener. For more demos, reviews and how-to’s, check out MyBinding.com. The Martin Yale Premier 1632 Automatic Letter opener is designed for small and medium sized offices and mail rooms that are looking for a fast and easy way to open hundreds of envelopes per day. It is designed to be fast, safe and easy for any member of your office staff to use. The Martin Yale 1632 is simple to assemble, set up, operate and requires minimal maintenance. This helps to make this machine an ideal solution for organizations that want to increase productivity and allow their employees to spend time on more important tasks than opening envelopes. The Martin Yale 1632 is a high speed letter opening machine. In fact, it can open more than 7000 letters per hour. You simply need to add a stack of envelopes up to 1.75 inches tall and the machine will feed, open and conveniently stack the envelopes on the other side of the unit. The productivity offered by this unit can potentially save a medium size business hundreds of man hours per year in soft costs by centralizing the letter opening process. When you open the box for a new 1632 letter opener you will find that there are four small rubber feet inside the box. These rubber feet are designed to stick on the bottom of the machine to ensure that it does not move during the letter opening process. It is important to remember to install these feet when you first set up the machine as they help to ensure that the letter opener operates at maximum efficiency. The Martin Yale 1632 is designed for use with all standard sizes of business mail including #6-3/4, #8, #9 and #10 envelopes. The 1632 high speed letter opener is actually fairly compact. It only weighs about six pounds and measures 19.5" x 15.5" x 7.75". This makes it ideal for offices where counter space is at a premium. Like most other letter opening machines, the Martin Yale 1632 cuts off a small portion of the top of the envelope to open the letters. Although this is highly efficient, if the materials inside the envelopes are not aligned in the bottom of the envelopes, the machine will potentially slice into the contents of your letters. In order to deal with this problem it is advisable that the Premier 1632 letter opener be used in conjunction with a paper jogger or envelope jogging machine. A jogger will help to ensure that all of the documents inside your envelopes are positioned correctly for the letter opener to do its work. However, with all letter openers, there is still the possibility that overstuffed envelopes or letters with non standard sized documents may be sliced in the letter opening process. The Martin Yale 1632 is ideal for use with standard sized business envelopes. However, the maximum size of envelope that can be opened with the 1632 is a #10 business envelope. Larger sized letters will still need to be opened by hand. The same is true for envelopes that have been damaged in the mail or for envelopes that are extremely thick and overstuffed. Over time this machine may require some maintenance which potentially includes the replacement of the belts that feed the letters through the machine and the replacement of the letter opening blades. With normal usage, this machine should last for years without the need to replace these items. However, if you deal with more than a thousand letters per day it may be a good idea to allow some room in your budget for maintenance costs. Although you can add a stack of envelopes to this machine that is up to 1.75" thick, the 1632 works best if you fan the letters before adding them to the machine. It also works best if you are opening a stack that contains all of the same sized envelopes. The Martin Yale 1632 letter opener is ideal for organizations that are looking to open up to one thousand standard sized letters or envelopes per day. It is an introductory model designed for a small to medium sized mailroom and can help to centralize the mail opening process inside your organization. This can potentially save your company thousands or tens of thousands of dollars in soft costs associated with the opening of letters and mail.